The Carolina Panthers have this going for them: There has never been a more overlooked 15-1 (and now 17-1) team in NFL history. The Panthers, who averaged 31.3 points per game, and whose only loss was by seven points, have actually won 22 of 24 dating back to last season, including playoffs, after a 3-8-1 start in 2014. 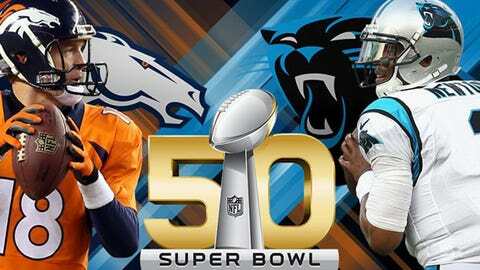 The Panthers are only the third 15-1 team to make the Super Bowl. The first two were the 1984 49ers and 1985 Bears. The 49ers pummeled Dan Marino’s Dolphins, 38-16, and the Bears dismantled the Patriots, 46-10, with their vaunted defense. Duh, right? Their MVP front-runnier accounted for 45 total touchdowns this year and combined for 4,473 total yards. More than just putting up gaudy numbers, however, Newton has become a fantastic pocket passer, which has bolstered the threat of him running. He also had the highest passer rating of his career at 99.2. He’s pulled games out of the fire for the Panthers. He led a crucial game-winning drive against Seattle in Week 6. He led an overtime win over the Colts in Week 7. He survived shootouts with the Saints and Giants in Weeks 13 and 15, respectively. It’s his leadership that’s taken over, and he’s going to be the reason they win or lose on Sunday. Newton makes plays with his arm, and the Panthers’ passing attack has evolved this season, but their running game is what sets them apart. Carolina was second in the NFL with 142.6 rush yards per game. Running back Jonathan Stewart – no longer splitting time with DeAngelo Williams – was featured this season and put up 989 yards on 242 carries with six scores. Newton added 636 yards and 10 touchdowns with his legs, and Mike Tolbert picked up 256 yards on 62 carries. One of the statements of the Panthers season came when Stewart opened the divisional-round game against the Seahawks with a 59-yard run. He’s not Rob Gronkowki nor is he the ghost of Jimmy Graham, but Olsen is the best receiving threat the Panthers have and it’s at a position that isn’t easy to cover. He causes matchup problems for defenses and has stepped up in the absence of Kelvin Benjamin, whose loss most pundits thought would KO the Panthers season. But Olsen had a career year with 77 catches for 1,104 yards and seven scores. It’s his second straight 1,000-yard season and third straight season with at least 73 catches. The Denver Broncos may have to get creative in covering him, possibly using corner Aqib Talib to shadow Olsen for parts of the game. Their defense was sixth in sacks, points allowed and total yards and was a turnover machine, leading the NFL in takeaways with 39. Cornerback Josh Norman has been arguably the best cornerback in the league this season, and despite his antics with Odell Beckham Jr., his play on the field spoke volumes. Defensive tackle Kawann Short should be a household name after his 11 sacks, and linebacker Luke Kuechly, who missed three games with a concussion, still racked up 118 total tackles. He’s had pick-sixes in both of the Panthers’ playoff wins so far, and is a force. With Short, Kuechly and Norman, the Panthers have stars at all three levels of their defense. Every Cornerback ranked from best to worst this season. Evenly-contested Super Bowls can often come down to a play or two that tips the scale in one team’s favor. And when it comes to special teams, the Panthers have a big edge. Ted Ginn Jr.’s impact as a wide receiver this season has been huge (his 10 touchdowns speak for themselves). But Ginn’s punt-return prowess could provide an edge in the field position game. He averaged 10.3 yards per return this year, and in six games he had over 30 yards on punt returns. And that’s significant because in five games he had no returns at all.